There is a joke of sorts in Charleston, SC; that of “If the Coburg Cow comes down, evacuate,” and during the recent visit by Hurricane Florence, the Coburg Cow became meme-worthy. It also came down. Florence was an incredibly dangerous storm and spared Charleston proper by single-digit miles. If the Coburg Cow is a storm severity indicator, it has a more famous brand cousin, that of The Waffle House and The Waffle House Index. The term “Waffle House Index was coined by FEMA Administrator Craig Fugate in May 2011, following the 2011 Joplin tornado, during which the two Waffle House restaurants in Joplin remained open. The measure is based on the reputation of the restaurant chain Waffle House for staying open during extreme weather and for reopening quickly, albeit sometimes with a limited menu, after very severe weather events such as tornadoes or hurricanes. Waffle House, along with other chains (such as Home Depot, Walmart, and Lowe’s) which do a significant proportion of their business in the southern US where there is a frequent risk of hurricanes, have good risk management and disaster preparedness. Because of this, and a cut-down menu prepared for times when there is no power or limited supplies, the Waffle House Index rarely reaches the red level. As Craig [Fugate] often says, the Waffle House test doesn’t just tell us how quickly a business might rebound – it also tells us how the larger community is faring. The sooner restaurants, grocery and corner stores, or banks can re-open, the sooner local economies will start generating revenue again – signaling a stronger recovery for that community. The success of the private sector in preparing for and weathering disasters is essential to a community’s ability to recover in the long run. —  Dan Stoneking, FEMA News of the Day – What do Waffle Houses Have to Do with Risk Management? Is Resiliency Really a Brand Attribute? Long Answer: Preparedness and resiliency are key brand attributes for every organization. Caring about and acting upon initiatives that highlight the health and safety of everyone in your organization, and by extension your community, demonstrates a sincerity of purpose that is reflected across an organization’s brand. Vendors want to work with resilient organizations and most important, clients and customers want to be assured of an organization’s longevity. All crises are not equal. Crises have varying causes and intensities. Understanding the impacts of a crisis empowers leadership regarding the decisions to make, actions to take, and words to say. Waffle House, Lowe’s, Home Depot, WalMart and other enterprise-level organizations understand this; they understand how to prepare for the time when control of events and messages are lost, impacts accelerate and public scrutiny intensifies. We have always known that companies vulnerable to supply-chain disruptions from natural disasters can gain a competitive advantage by implementing strong risk management plans, but suffice it to say that ALL companies vulnerable to disruptions from natural disasters can gain a competitive advantage through preparedness. People have praised Ehmer on social media for his hands-on efforts and this has an immediate and highly visible impact on the Brand. Firestorm produces a number of reports that can assist you in understanding how your organization measures up against your peers and best-in-class. 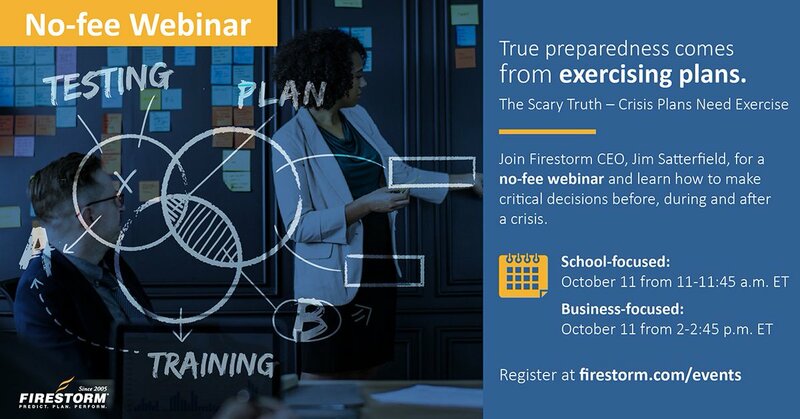 Understanding how others activate their plans and for what duration may help you make better decisions in your own disaster and crisis event planning and can help your organization become a Resilient Brand.